↑ Butler, Bethonie (November 27, 2018). 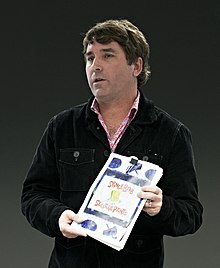 "'A man who put joy and love in the world:' Animators and fans mourn 'SpongeBob' creator Stephen Hillenburg". The Washington Post. 喺November 27, 2018搵到. ↑ "People Search: Hillenburg, Stephen". Veromi. April 5, 2010. 原先內容歸檔睇December 20, 2013. 喺April 5, 2010搵到. (要訂 (help)). ↑ 3.0 3.1 K.E.D. (April 2003). "Cover Biography for April 2003". Current Biography. （原先內容喺August 14, 2011歸檔）. 喺December 20, 2013搵到. ↑ Staff writer(s); no by-line. (October 15, 2001). "FleshStephen RoundPants". The Washington Post. Nash Holdings. （原先內容喺2014年6月10號歸檔）. 喺December 20, 2013搵到. ↑ Staff writer(s); no by-line. (September 25, 2008). "Kelly N. Hillenburg Jr.". Bangor Daily News. Islesford and Morro Bay, California: Bangor Publishing Company. 原先內容歸檔睇February 24, 2016. 喺November 20, 2016搵到. ↑ Otterson, Joe (November 27, 2018). "'SpongeBob Squarepants' Creator Stephen Hillenburg Dies at 57". Variety. 喺November 26, 2018搵到.